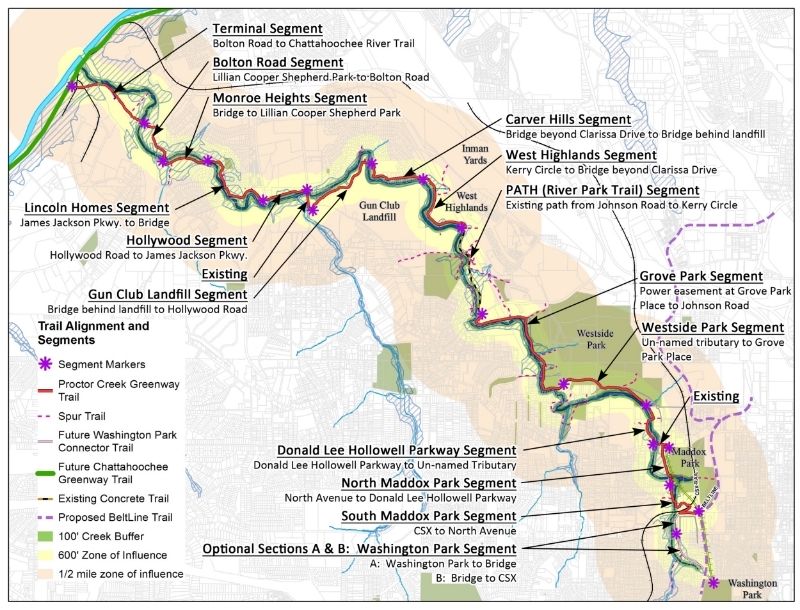 The Foundation is collaborating with the City of Atlanta to create the Proctor Creek Greenway. The Greenway will be a new seven-mile system of trails totaling 400 acres of public green space that will be sited adjacent to the creek, within a protection zone that will cover the vital and vulnerable buffers of the waterway. Trails will begin at Maddox Park and Proctor Park, pass through West Side and Grove Parks, and connect multiple schools including Grove Park Elementary School, Boyd Elementary School, Westside Atlanta Charter School, Best Academy at Benjamin S. Carson, and Coretta Scott King High, en route to the Chattahoochee River. The Greenway will be outfitted with benches and signage, and will be open from dawn to dusk. All assembled greens paces and constructed trails will be donated to the City of Atlanta.